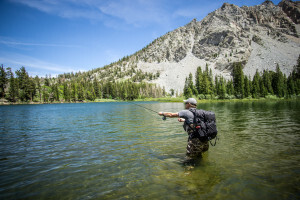 one, hike along streams, or backpack in the high sierra back country, June Lake has beautiful hiking for the whole family and for all skill levels to enjoy! 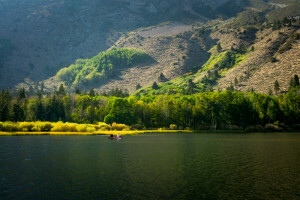 Below you will find a list of several beautiful hikes and nature walks that are close by in the June Lake area. The trails to Yost and Fern Lakes start at the same trail head: within walking distance from the Double Eagle Resort! 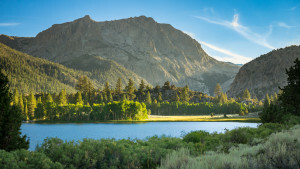 You get a beautiful panoramic view overlooking the June Lake Loop. The trail crosses over Fern Creek, a long cascade coming down from Fern Lake. Find out more about this adventure in our blog! The Fern Lake trail is not a long hike as far as distance goes, but don’t let that fool you! You will gain over 1500 feet of elevation in less than two miles. That being said, you get beautiful panoramic views of the June Lake Loop. It is a tough hike, but ends at the beautiful Fern Lake. (There are tons of little Brook Trout to be fished up there as well). The trail around Gull Lake is excellent for all ages and skill levels! It simply circles the lake with very little elevation gain/loss. But just because the hike is easy doesn’t mean it isn’t rewarding! The views of the lake and surrounding area are incredible! Including rocky hills, lots of trees, and golden fields. Not to mention there is a rope swing! Find out more about this adventure in our blog! Parker Lake is a beautiful hike with so much to see! The beginning is very deserty, but as you hike in you get closer to Parker Creek and all of the sudden you are surrounded by Towering Pines and Glittering Aspens. Parker Creek is so peaceful, you start to feel like you are in a fairy tale. The trail ends at Parker Lake: An incredibly aqua-colored body of water nestled between mountains. Find out more about this adventure in our blog! 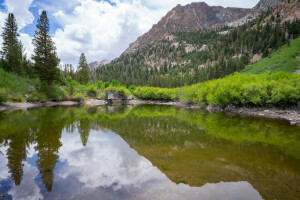 The Reversed Peak Trail is a hidden gem hike of the June Lake Loop. It will take you to the highest spot in the heart of the loop, which means you have a 360 degree view of the entire area! It gives you a great perspective of the whole June Lake Loop and is a hike you don’t want to miss! Find out more about this adventure in our blog! 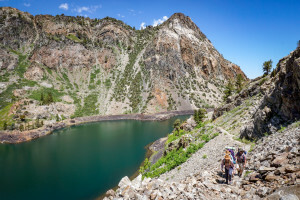 The Walker lake trail is a short 1 mile trip, however there is about 800 feet in elevation change in that short mile, which makes it one of the more difficult hikes in the June Lake Loop. Don’t let that discourage you though! This hike starts above the lake and you hike down to it. Just a few yards past the trail head, you can see Walker Lake. Stay tuned for a full blog post about the hike to Walker Lake! The Rush Creek Trail is a gateway to all the beautiful Sierra Back Country you could ever hope for! 2 miles in to the trail you will run into Agnew Lake, one of several Reservoirs that can be reached via the Rush Creek Trail. This trail meets up with other famous paths like the John Muir Trail and the Pacific Crest Trail. The backpacking possibilities are endless!